NetSuite holds promise for transforming businesses by boosting sales performance, enhancing customer experience and dramatically improving operational efficiency. It’s no surprise leading companies from all verticals including E Commerce, Wholesale and Distribution, Manufacturing, Logistics and IT services are increasingly leveraging NetSuite Cloud ERP to access valuable customer information and gain powerful insights into sales and finance data. But these benefits can only be realized if NetSuite ERP implementation is positioned for success from the very onset. How can companies ensure this? First, they will need to set the right expectations for their ERP software. Second, they must have a dedicated team in place to see project through completion. Offering wide ranging functionality, today’s ERP solutions range from out-of the-box to custom and from on-premise to cloud. You could choose on-premise ERP, but in doing so, it is important to factor the upgrade of old version of ERP software that might increase the risk of losing critical customization and integration. Another option is to pick custom ERP deployment and program from bottom up. However, this may result in increased cost and complexity. A cloud-based ERP such as NetSuite, on the other hand, is easier and faster to deploy and significantly reduces the upfront investment cost. Leveraging the capabilities of an experienced NetSuite solution provider can help you customize and integrate NetSuite with your business seamlessly for optimal results. 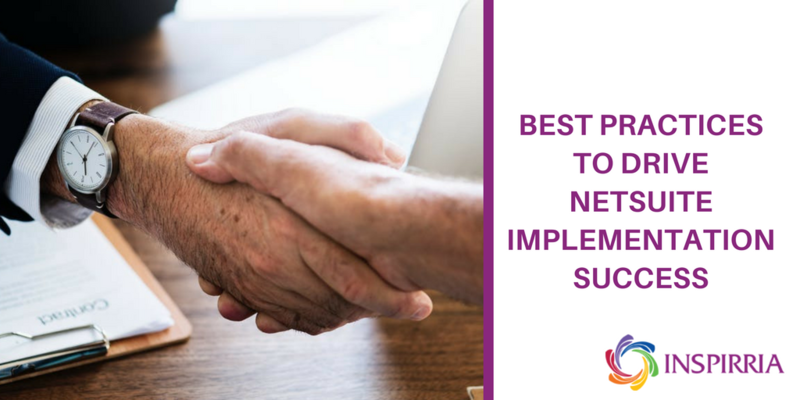 One of the most important decisions to make during the NetSuite implementation process is to choose the right team with the right expertise to get the job done. In addition, while engaging with a NetSuite partner it is important that you are comfortable with the team’s methodology. A good implementation team not only completes ERP deployment on time and within budget but also provides a clear project roadmap of what lies ahead, and follows well-established processes for design, validation, testing and user adoption. The team should also have the expertise to take advantage of NetSuite’s open integration environment to enable a unified view of data. For instance, sales personnel should have an end-to-end view of customer information - without having to navigate multiple systems. ERP can bring a plethora of benefits to businesses such as rapid financial close, reduced IT costs, low order-to-cash cycle and expedited delivery. However, realizing these benefits requires careful planning and execution. For instance, resist the temptation to over-customize as NetSuite is preconfigured to incorporate industry best practices that support complex business processes. Also, consider working with renowned NetSuite partners who can help you plan judiciously and configure carefully, to get most of out of the implementation. Such a partner can also help you prioritize, reduce the impact of change management, and spread the cost of improvement. Whatever the nature of your business, ERP implementations are critical to efficient business process and organizational success. Organizations not only need to understand and recognize the success drivers but also consider cost and the commitment required by project teams and business leaders to ensure success. Taking a phased approach to implementation works best – start small, realize the benefits quickly and then move on to other larger projects – thereby speeding up time to ROI and management buy-in. Inspirria Cloudtech is a leading NetSuite partner offering cloud ERP NetSuite implementation services. We leverage more than 15 years of experience and data-driven strategic cloud assessment capabilities to help companies drive operational excellence and improve ROI.